Charity MEAS said the pub crawl exacerbates our cultural problem with alcohol and encourages binge drinking. A CHARITY THAT promotes the “mature enjoyment of alcohol” has appealed to Christmas revellers to abandon the much popular “12 pubs of Christmas” excursions. The Chief Executive of MEAS (Mature Enjoyment of Alcohol in Ireland Limited) Fionnuala Sheehan said the practice “is totally contrary to the principle of responsible drinking”. She added that the “12 Pubs of Christmas” is exacerbating the less acceptable way in which some Irish people tend to interact with alcohol. While she acknowledged that it was the season “to be jolly” she said “this kind of pub crawling needs to be dropped”. This kind of festive indulgence feeds into the cultural problem associated with how some people drink in Ireland. In overall terms we drink less often in Ireland than our European counterparts, but when we drink we tend to drink more and at a faster pace. Clearly the 12 Pubs practice exacerbates this ‘binge drinking’ pattern and this style of drinking. Sheehan said that medical advice states that more than five standard drinks in one sitting can increase the harmful effects of drinking, adding that a standard drink is classed as a glass of cider/lager, a small glass of wine or a pub measure of spirits. “If someone drank only one standard drink in each of the twelve pubs they seriously increase the risk of such harm. If they drank one pint in each of the twelve pubs they very seriously increase the risk of harm,” she said. MEAS is a not-for-profit company to promote the responsible use of alcohol. In 2006 it established drinkaware.ie, an online consumer focused programme. So, we want to know what you think. 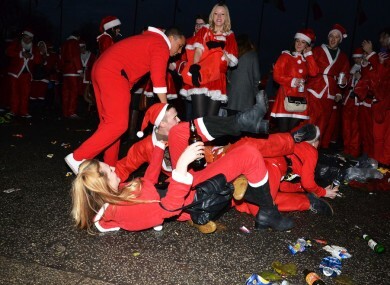 Do you think that the 12 pubs of Christmas promotes irresponsible drinking? Have you or will you be taking part in one? Tell us in the comments section below. Email “12 pubs of Christmas feeds into Ireland's problem with alcohol, says charity ”. Feedback on “12 pubs of Christmas feeds into Ireland's problem with alcohol, says charity ”.